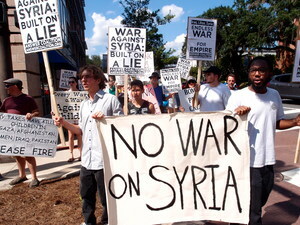 600 people gathered in Chicago’s downtown Federal Plaza at to demand that Congress vote no to a new war in Syria. The demonstration was organized by ANSWER Chicago, the Anti-War Committee-Chicago and the Syrian American Forum and was endorsed by many other activist organizations. The protestors rallied in Federal Plaza where many speakers, including labor representatives from SEIU and AFSCME, expressed the need to take a stand against the push towards another criminal war in the Middle East. 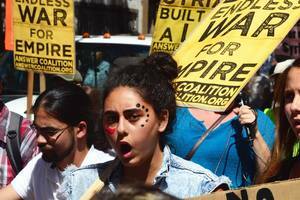 Many speakers also pointed to the fact that, though the government has the funding to wage war on Syria, the City of Chicago finds it necessary to dismantle the public education system and close a historic amount of schools. The demonstration then marched from Federal Plaza, up Michigan Avenue to the Chicago Tribune Tower where another rally was held with speakers including Ymelda Viramontes from Woman Organized to Resist and Defend. The people in Chicago, like the majority of the country, are against the sounds of the imperialist war drums coming out of the White House and Pentagon and will continue to take to the streets until these wars for Wall Street are defeated. Around 650 people gathered in San Francisco's Chelsea Manning Plaza, which was recently renamed after the heroic whistle-blower previously known as Bradley Manning, to demand that the U.S. government not launch an illegal war against Syria. Speakers included representatives of the ANSWER Coalition, Party for Socialism and Liberation, World Can't Wait, Veterans for Peace, Workers World party, the West County Toxics Coalition, Women Organized to Resist and Defend, the National Committee to Free the Cuban Five, Justice for Filipino American Veterans and other groups. A reoccurring theme of the speeches made was the illegality, according to international law, of launching a war against a country for any reason other than national self-defense – something the Obama administration is not even trying to claim in its bid to win approval to bomb Syria. The spirited, diverse crowd then marched to UN plaza. 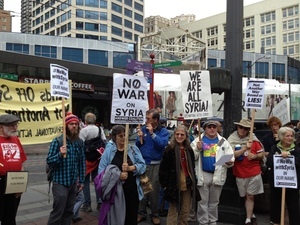 Anti-war protesters gathered at Westlake Park in downtown Seattle. A religious youth group had already reserved the park and was playing music; when activists went and explained what we were doing, the youth were very supportive and expressed their opposition to any potential attack on Syria. At around 1:00pm, protesters marched, taking the streets without a permit, and went to Seattle Center. Participating organizations included the ANSWER Coalition, World Can't Wait, Cascadians Against War and Fellowship of Reconciliation. More than 100 people from throughout Albuquerque came together on Friday to the plaza at the UNM to protest the U.S. war on Syria and to demand that Congress vote no on the war on Syria. The spirited crowd, made up mainly of students and youth, marched in the streets through the Nob Hill neighborhood while community residents waved and honked in solidarity. One U.S. Senator, Tom Udall, already voted against the war in the Senate Committee on Foreign Relations hearings. The people at the rally cheered when Joel Gallegos, ANSWER organizer said, "Now we must let Senator Heinrich and the New Mexico Congressional delegation know that we demand a no vote on war against Syria. We are united and know that if we stay in the streets, the people of this country can and will stop this war." The Tallahassee ANSWER Coalition, Code Pink, Iraq Veterans Against the War, Tallahassee Network for Justice and Peace and Veterans for Peace rallied at the corner of Monroe Street and Tennessee Street, a few blocks from the Florida Capitol. 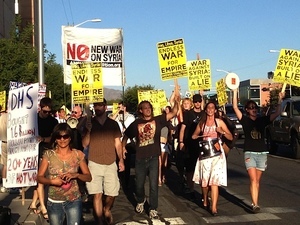 The demonstrators gathered to let Senator Nelson know that his support for the war is intolerable. The people's anger at the possibility of another war was apparent from the continuous waving, thumbs up and honking of car horns. At the end of the rally, the crowd marched to the U.S. Courthouse for the Northern District of Florida to deliver a signed letter to Senator Nelson demanding no intervention, chanting "US/NATO! 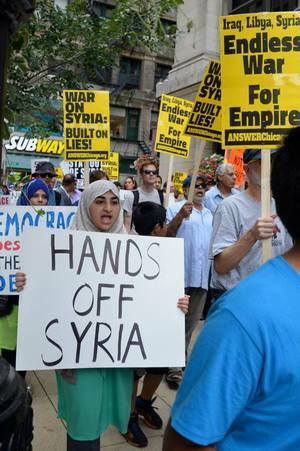 Hands off Syria!" and "No justice, no peace! U.S. out of the Middle East!"